Where to go? What to do? Where to stay? Those are the questions we ask ourselves in between rallies. We arrange our RV travel according to the rallies where we need to be to teach our seminars. Sometimes we have 2 days between rallies, sometimes we have 2 months. They’re always in the same quadrant of the country because we refuse to book rallies that make us drive back and forth across the country. This time we had 2 weeks to get from Indianapolis to Syracuse. Looking at the map, we had two main choices: under Lakes Erie and Ontario or over. We were kind of intrigued by the possibility of traveling in Canada for a while, then I noticed the two green markers just west of Toronto. What’s that? Clicking on one green marker revealed “Roadtrek Factory” and clicking the other showed “Boondockers Welcome.” Cool! We would like to visit both of those – decision made. How did those markers get there? They’re called “Want to Go” places and I add them whenever we learn of a place that we, uh, “want to go.” During our stay at the Escapade rally in Tucson last March, we met Marianne and Randy of Boondockers Welcome. We enjoyed chatting with them and they mentioned that we were welcome to boondock on their property just outside of Toronto if we ever found ourselves in the area. We had no current plans for traveling anywhere near Toronto, but I got out my phone and, using Google maps, I put a marker in their location. We also talked to them about our desire to downsize to a Roadtrek (like theirs) and they mentioned that the Roadtrek factory was near their home … I added another marker. It’s easy enough to do. You need the Google Maps app on a mobile device. This works on either Apple iOS, or Android, but not on a computer web browser version of Google Maps, at least not yet. You could also choose Favorites or Starred places, or you could make a list of your own, like I’ve done with Harvest Hosts or Thousand Trails. You can then choose to see the whole list, or to see the markers on your map. Just as the name implies – they are properties where boondockers are welcome. A boondocker is someone in a self-contained RV who doesn’t need any hookups to park. It’s also known as dry-camping. If you live somewhere with a space for an RV and you’re interested in meeting new people, you could sign up with the BoondockersWelcome.com website and we might come stay! I am SO glad I took a moment back in March to mark this want-to-go spot on my map. 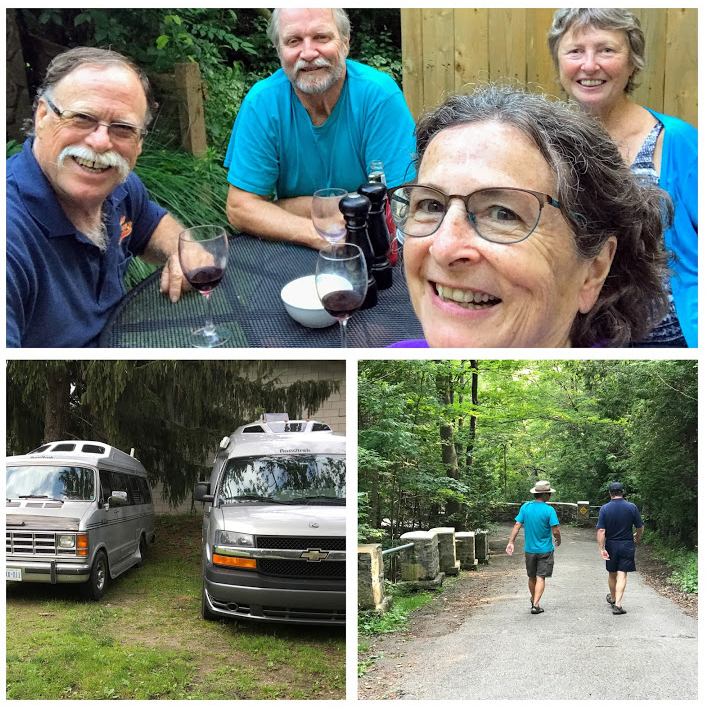 We had a great time staying with Marianne and Randy while we visited the Roadtrek factory. Marianne is the owner of the Boondockers Welcome website and we spent hours discussing website stuff. All four of us enjoyed beautiful walks around Elora, a few too many bottles of wine, and we’ve become friends! We don’t live in a place with RV parking, but if they ever fly to South Florida, we have a guest room for them! That’s how this lifestyle works.